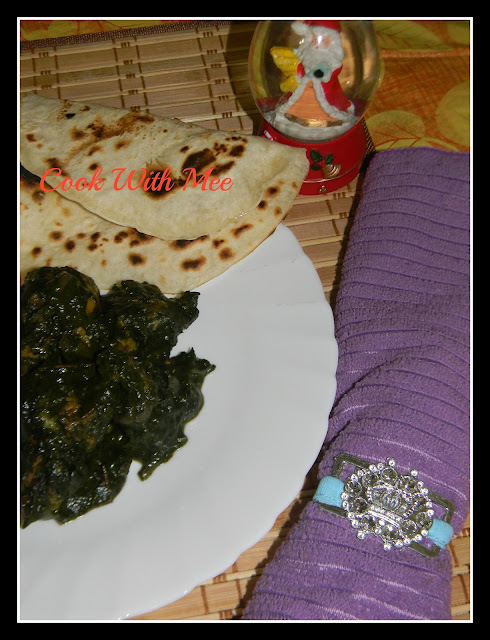 One more spinach item was our today’s dinner. As I told before me and my husband we both love spinach, so love to try something new always with spinach. Spinach is really very healthy and with chicken it’s become tastier. While doing grocery shopping I got lots of fresh spinach today, that’s why I can’t stop myself to prepare something with spinach. Spinach has a high nutritional value. And fresh spinach is really good for kids also. I used to add spinach in my daughters food too. This one I made with butter if you don’t want to add butter then you can cook in canola or sunflower oil also. Just add little butter after finishing the cooking. 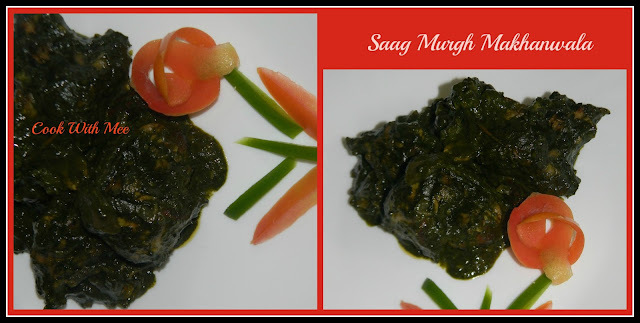 I named it Saag Murgh Makhanwala to this lovely dish and specially for upcoming holidays. 1.Chicken: 600 gm (boneless or with bone cut into small pieces). 2.One bunch of fresh spinach. 3.One medium finely chopped onion. 4.One table spoon ginger and garlic paste. 7.Cumin powder, Corinader Powder,Red chili powder, Garam Masala Powder (half tea spoon of each item). 8.Whole garam masala(2 clove, 2 cardamom, one small cinnamon stick, one small bay leave, few black pepper). 10. Salt and sugar as per taste. 11.Three table spoon butter or Sunflower oil. Marinate the chicken pieces with some salt, red chili powder, freshly crushed black pepper and curd for one hour. Now wash and chopped the spinach and boiled with some salt. Let it cool down, now make a smooth paste with that and keep it aside. Add some butter in a vessel and fry the marinated chicken pieces in high heat and keep them aside. Now add some more butter on the same vessel and add the whole garam masala after few second add the chopped onions, chopped tomato and ginger garlic paste and cook till the onions are transparent. Now add the spices powder with some salt and sugar, and cook till the oil separate. Now add the fried chicken pieces with the milk and cook with a lid till the chickens are almost done. Now add the boiled spinach paste and cook till the gravy become thick (around 4 to 5 mints in low flame). 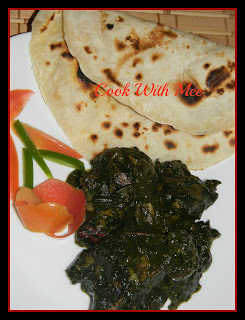 Your Saag Chicken Makhanwal is ready served hot with Roti or Paratha.